Hope everyone’s keeping cool during this hot weather we’re having! I wanted to let you know about a sake dinner that’s coming up in August. Yuwa Japanese Restaurant (formerly Zest) and Blue Note Wines & Sake are hosting a sake dinner featuring Okunomatsu Sake Brewery from the Tohoku region of Japan. This brewery just won the 2018 IWC (International Wine Challenge) Champion Sake Award, beating out hundreds of sake to win the top prize for their Okunomatsu Adatara Ginjo sake. This dinner will be the sake premiere for Okunomatsu into BC. There’s so many new and interesting sake coming into our market now, as sake continues to gain fans across the globe. Representatives from the brewery and Blue Note will be on-hand to share stories about the brewery and help with any questions you might have about sake. Here is the link to register and info for the kaiseki dinner. Hope you can make it to this very special event! Eat, sip and learn at Well Seasoned! Taste some amazing food & sake, March 5th at Well Seasoned. Chef Carl Sawatsky, Toji (Master Sake Brewer) Yoshiaki Kasugai from YK3 Sake Producer Inc, and I will share our love for pairing sake with an emphasis on non-traditional dishes. Guests will learn how to make these delicious meals, enjoy them with YK3 Brewery’s sake and learn some fun facts about Japan’s national drink. Learn the depth & breadth sake has to offer! Here’s the link to sign up for a spot. Seats are limited. Come for the first ever dedicated sake festival in Vancouver on September 29th! Most of the importers for sake in BC will be in attendance. 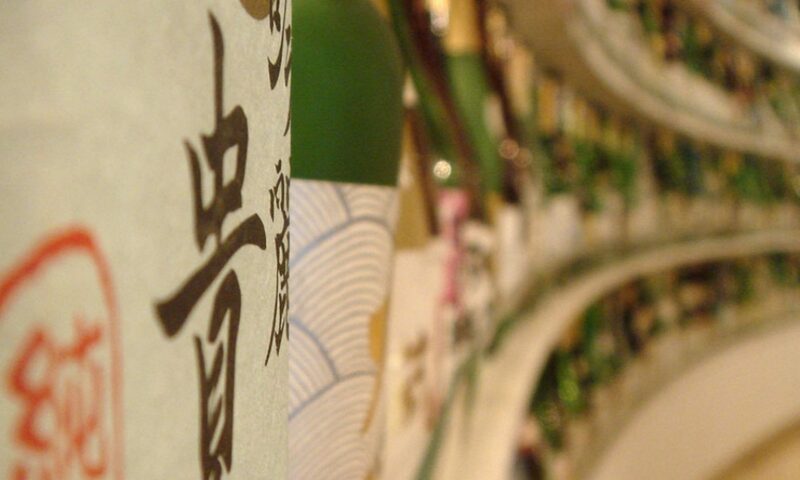 The Sake Association of BC (SABC) currently represents 12 importers in our market. There will be over 100 sake to sample and many brewery representatives will make the journey from Japan for this special event! I am honoured to do the trade seminar with my good sake buddy, Miki Ellis! If you are trade and are interested in our sake talk/tasting, please contact the SABC. It has been a crazy year, and through the ups and downs the constant has always been sake! 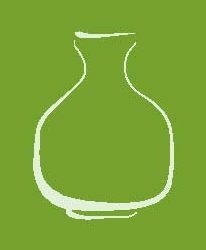 In the current edition of The Bulletin, the monthly magazine published by the Japanese Canadian Citizens Association, I have a few sake gift suggestions. We are getting more and more interesting sakes into the BC market. Get out there and explore the myriad of flavours and aromas each sake possesses and find what fits your palate. Legacy Liquor Store in the Olympic Village neighbourhood has a dedicated sake fridge. The sake is stored cold and therefore fresher, as it doesn’t degrade as fast. Kitsilano Wine Cellar on 4th Ave has a great sake selection. If you like the big magnum-sized sake bottles called isshobin (1.8L), Kits has the largest selection in town. BC Liquor Store – Cambie and 39th – has more sake than most of the government liquor stores. That’s not saying much, but if you don’t want to pay the extra retail markup at private stores, this is one of the few government-run stores with a better-than-the-usual-pathetic selection. Viti Wine and Lager located in Downtown Vancouver, has some interesting sakes, many of which lie in the fridge. However, last time I was there buying a few sakes, the clerk asked me what I was buying. They had no clue it was sake. I gladly explained what it was and why the sake was so cool. That’s kinda sad and certainly doesn’t help to support sake. Education is the key, but nonetheless their buyer has chosen some nice sakes. If you can find it on your own, then you’re golden. (Updated) Lulu Island Liquor Store in Richmond (no website) has a very decent selection of sake, and prices are good here. It may seem a bit drab from the strip-mall exterior, but don’t let that detract you from going in–there’s good sake to be found within. Happy Holidays! I hope you have a wonderful holiday season filled with much sake. Upcoming: Vancouver’s Largest Sake Tasting Event – October 10th! Happy Belated Sake Day! October 1st is Nihonshu no Hi — the official start to the sake brewing season in Japan. There are many events going on this month and we are fortunate to have Western Canada’s largest sake tasting event to coincide with October’s global sake celebrations. 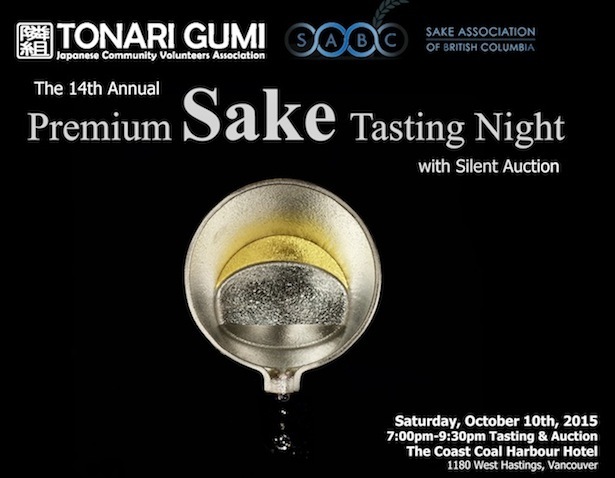 Tonari Gumi’s 14th Sake Tasting Event will be held on October 10th, 2015 from 7:00-9:30pm at the Coast Coal Harbour Hotel. More info can be found on the event’s Facebook page. This fundraising event to help support Tonari Gumi’s social programs for seniors and new immigrants is vital to the organization. Tickets are $75 per person, in advance until October 9th, and there’s also VIP tickets you can purchase which are $95. VIP’s get a special seminar and exclusive tasting prior to the event start. Go to their FB page for more details. Along with a huge selection of sakes — 13 importers from the SABC, the Sake Association of BC, will be on-hand to pour and share great stories about their sakes — there will be a ton of nibbles to accompany the array of nihonshu you’ll be able to taste. Well-known local restaurants such as Forage, Octopus’ Garden, Minami and Hapa Izakaya will be preparing delicious appetizers for the event. A silent auction with lots of goodies will be available as well. Sounds like a fun night and all the money goes to helping a worthy cause. Hope to see you there! To find more about Tonari Gumi and their programs, please check out their website. They have many events going on year-round, including special food and sake events. I did a great seminar at their new facility back in March and it was a lot of fun. So please go check out their website for other upcoming events.